Contender Francis Ngannou (right) believes Stipe Miocic (not pictured) deserves a UFC title rematch, but fellow heavyweight Cain Velasquez (left) is not convinced. Contender Francis Ngannou believes Stipe Miocic deserves a UFC title rematch, but fellow heavyweight Cain Velasquez is not convinced. CLEVELAND — Former UFC heavyweight champion Stipe Miocic has been pining for a title rematch since dropping the belt to Daniel Cormier in the main event of UFC 226 at T-Mobile Arena in Las Vegas last July, and to this point, those requests have not been granted. Heavyweight contenders Francis Ngannou and Cain Velasquez, who will fight in the main event of a UFC Fight Night event in Phoenix Sunday, spoke on the idea of Miocic getting his rematch with Cormier, and they had differing opinions on the matter. 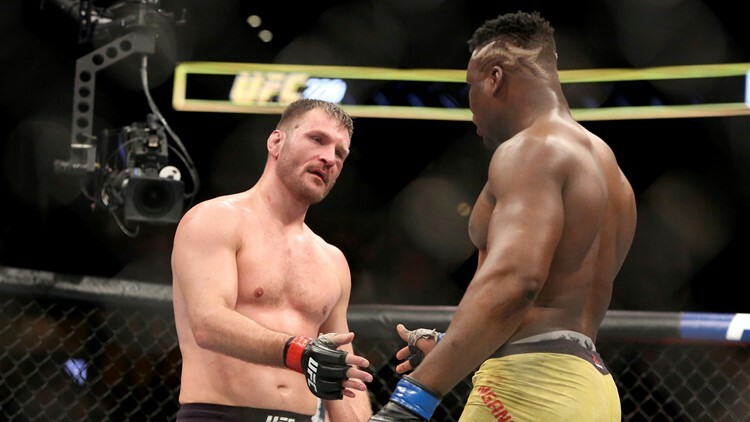 UFC heavyweight champion Stipe Miocic (left) shakes hands with Francis Ngannou after their title bout at UFC 220 at TD Garden in Boston on January 20, 2018. Miocic retained his title via unanimous decision. Velasquez addressed the matter during the media lunch event ahead of this weekend’s fight card, and did not seem so willing to watch his American Kickboxing Academy teammate, Cormier, step back in the cage with Miocic. “When (Cormier) had the opportunity to fight him, I didn’t see anywhere where Daniel would lose that fight,” Velasquez said, according to BJPenn.com. “I was pretty confident in that. Ngannou has first-hand knowledge of Miocic’s skills in the cage, as he lost a unanimous decision to him in a heavyweight championship fight at UFC 220 last January. Miocic is no stranger to getting a rematch against a competitor who has gotten the better of him. Nearly three years after suffering a decision loss to Junior dos Santos in Phoenix in December of 2014, Miocic successfully defended the UFC heavyweight championship against the heavy-handed, hard-kicking Brazilian with a first-round knockout at UFC 211 in Dallas, Texas in May of 2017. 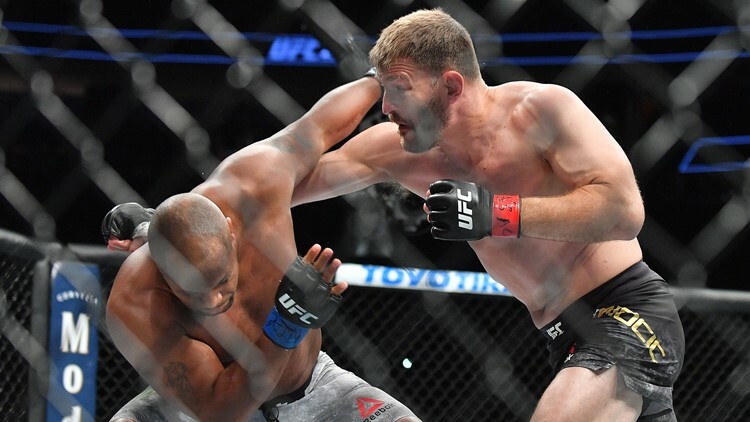 Stipe Miocic (right) throws a punch against Daniel Cormier during their UFC heavyweight championship fight at T-Mobile Arena in Las Vegas, Nevada on July 7, 2018.